And thus concludes our Epic Rambo Rewatch. The fourth entry, titled John Rambo or simply Rambo depending upon which version of the Blu-ray you're watching, is most notable for being the least Rambo of all the Rambo movies. There aren't many hallmarks of this franchise but the most recognizable of them, namely a scene in which Rambo slowly takes out a group of enemies in an enclosed space one at a time as well as the presence of an on-the-nose power ballad over the closing credits, are conspicuously absent in this (perhaps) final go around. It's therefore hard not to walk away from this movie feeling like Rambo/Stallone accidentally wandered into some semi-generic action film. Julie Benz will try your patience as she spends most of the first half of the film blandly monologuing, although every time her dickhead fiance wanders into frame the potential for unintentional comedy skyrockets. (I'm looking at you, awkwardly staged boat scene.) And Stallone's desire to legitimately educate the audience about the plight of the Burmese people while simultaneously portraying the military as virtual caricatures of evil is so blunt that it's kind of astounding. It's as if he's trying overly hard to justify the violence that Rambo will visit upon these bastards later on. But stick around because the last 20 minutes is a glorious melee of CG blood and guts as Rambo rips throats, cuts off heads and shoots guys so severely that they simply explode into a completely liquid state. It's awesome. 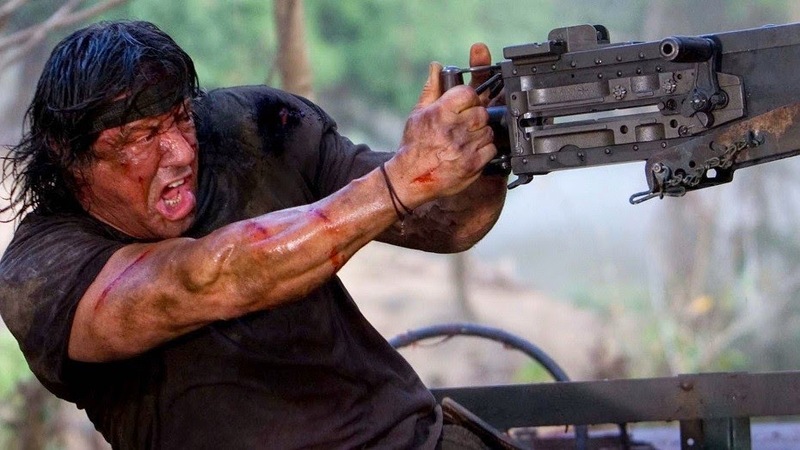 I'm really happy with the say this whole revisitation played out, as it gave me the chance to honestly re-evaulate the Rambo franchise for the first time in a decade. I discovered that Rambo III was much better than it gets credit for, while First Blood Part II is kind of an overhyped snore. I'm can't wait to dig into the next franchise on our docket, Terminator. A note on this week's podcast: We spend a bunch of time talking about Marvel's plans for Avengers 3 and beyond, name the idea that most of the current Avengers may not actually appear in that film and the possibility of Sony, in a fit of desperation, finally allowing Spider-Man to play in the Avengers sandbox. As I was posting this podcast last night the news broke concerning Robert Downey Jr's deal to appear in Captain America 3, signaling the beginning of Marvel's Civil War storyline. I'll have more thoughts about this later, but I stand by everything we talked about in the podcast and I think our positions are pretty fairly validated by this latest development. Also, fair warning: The section where we watch 80's sitcoms of our youth is a little uneven from an audio perspective. The TV audio is a little quiet and our reactions are pretty loud. Be glad that I edited that section down a bit, particularly the moment from the Small Wonder pilot where the son gropes his robot sister and says, "She even feels like a girl," which literally sent us screaming out of the room in horror. It's a wonder we didn't break the microphones. Next Week: Brad Pitt drives a tank in Fury and hopefully also The Terminator.